Only slightly less creepy looking, and semi-undergarmented. I worked on a few things today, after waking up by watching some YouTube videos. I found a girl’s channel, named Chezlin, that does different kinds of arts and crafts, a lot like me. She had a video on needle felted cat toys. Watch it here, and check out her other videos. There’s links to her blog and other sites in the description on the video. In the cat toy video, one of the toys had bells in it. I thought it was a good idea, but with all the padding, it might soundproof them. So, I made a ball for my own cats, making a rattle, using two bottle caps and a soda tab. Put the tab in the middle of the two caps, and tape it all up securely. You can use other things to do this, such as a coin, rice or some beads. You could replace the bottle caps with little toy eggs from vending machines, or little paint containers or film canisters. 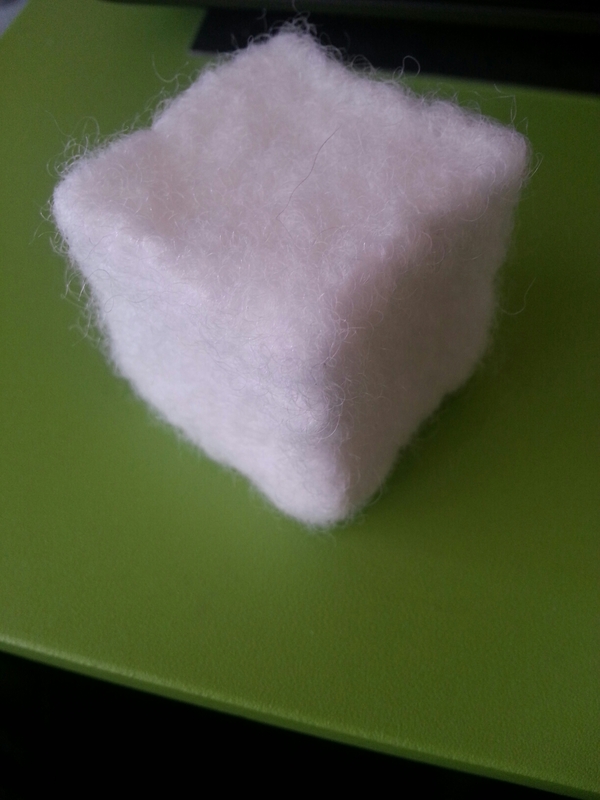 Anything that has room for the inner object to move, and make noise when they hit together, but small enough to be a nice light ball when covered in wool. The sound will be muffled slightly, but remember if your cat wants to play at two in the morning, you might not want it to be too loud. Cats have super hearing anyway, so a subtle sound is fine. Once you have your rattle taped up, just wrap in wool, and felt with a needle, avoiding poking straight into the rattle. Since my rattle was coin shaped, I had to build up more on the flat sides, to make the shape more ball like. It doesn’t have to be perfect, but it’s good if it can roll. I didn’t compact it a great deal, but it rolls nicely, and bounces quite well. It was one project they stole that they were allowed. Not looking any less creepy, but slightly like Patrick Stuart. So, a few things that I didn’t count on with the yarn fluff that I chose for the skin. Firstly, the colour is dulled down a lot, and has only a touch of the original colour. Secondly, its rather transparent, so it need a few layers to cover the previous colours on the face and bring up the intensity of the colour a little. Being a softer material also doesn’t help the shaping of the lips and eyelids. Lucky the head is rather smallish, allowing for a few layers worth of room to play with. It seems to smooth out over regular stuffing nicely, though. Most of her skin will be covered in armour, so I’ll use a grey to cover most of her, which, unlike the skin, won’t matter if it’s too light and not getting enough vitamin D.
Now I just need to buy some grey, as I recently used it all on another project… Along with most of my wool, for a blanket… That needs more wool to finish it. Aaaand I’ve spent next pay in my head, already. Time flies, when you’re stabbing fun. I was going to have an early night, and all. I wanted to make another cat, so I made a pipe cleaner armature, and tried to cover it with some fluff that I’d made from some variegated brown acrylic yarn. It was probably too small or something, as it was too tedious, even for me, and I gave up for now. Instead, I began using the fluff to make a ball, then practiced making some thin shapes, that I had trouble with previously, and they looked like bunny ears, so I attached them. The acrylic seems to knot quicker and tighter than the wool, so it might be why smaller shapes are easier. 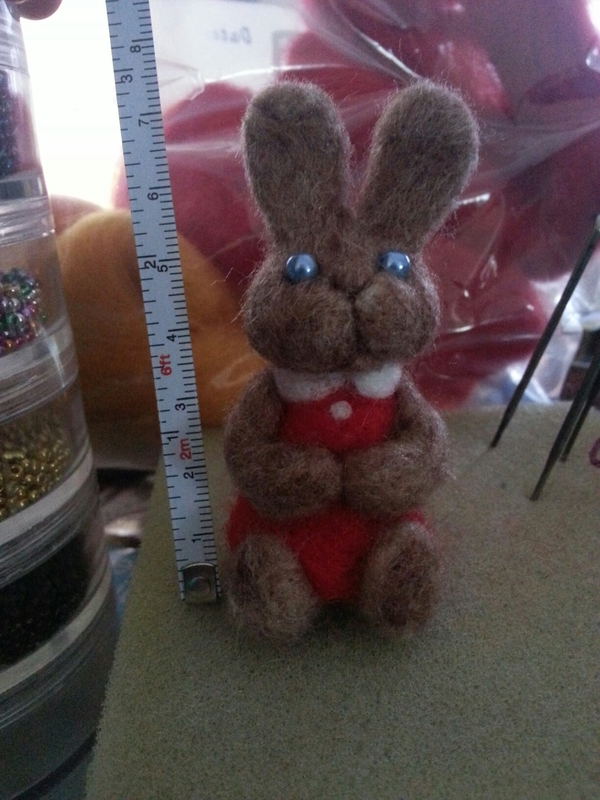 Once I got to this stage, tearing myself to bed, I decided it would be so cute to make a little girl bunny with a light blue or red dress. Maybe I should do both and have sister bunnies. I like how the different shades of brown show in different areas. This wouldn’t have happened if I had continued brushing the yarn, and let it all mix more. 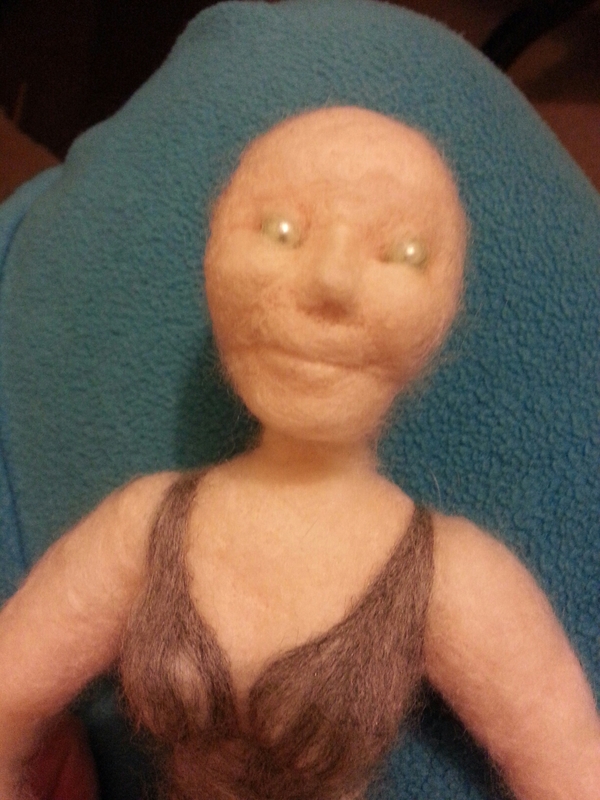 It slightly mixes the colours as you work the felt, so I didn’t bother beforehand. I did a little more work on my doll, making her more feminine with a nice figure. She still looks crazy and her feet are facing sideways for some reason, but it’s slowly progressing. I haven’t found any wool that I can use as a skin tone yet, so I could try some yarn, as its easier to find colours in that. I think I even have some around the house, somewhere. Time to sleep, so I can craft and game more tomorrow. Night y’all. Every time I start a project, I think of two more. It’s like a never ending pyramid scheme of creativity. I’ve had to start writing down ideas, more than usual, so I can continue with each project. 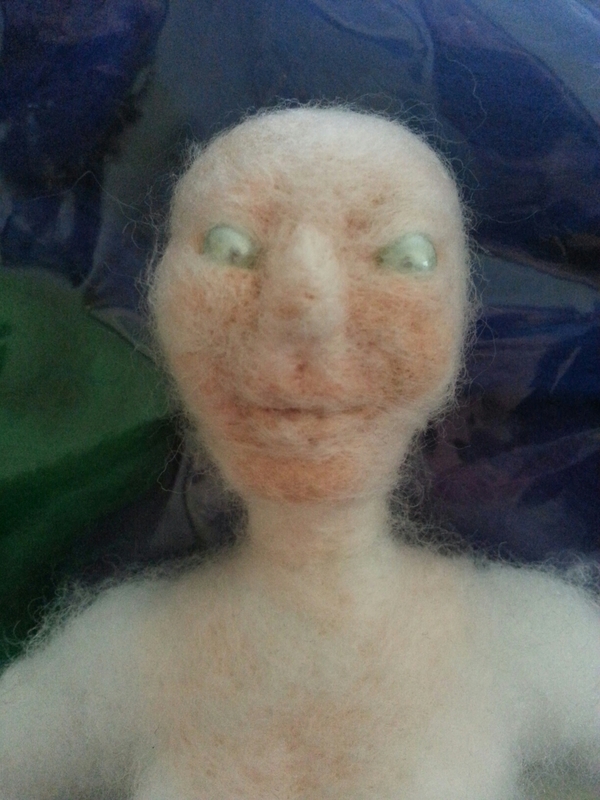 Tonight, I had about four different felting objects that I was switching between because it’s fun and keeps me going. I’ve been wanting to get out my clay, but that would involve cleaning, and space, so I just tend to stick to felting which doesn’t need much room or setup. Perhaps I’ll get to clay when I’ve thought up enough designs that I can just model them without the thinking in between. I’ll have time on the bus on my way to gym to write out ideas. Otherwise I’m usually crafting, gaming, or sleeping. I recently stopped my game design course that I was doing, and thought I would have nothing to do, but I’ve spent more time being able to create without feeling guilty that I should be doing homework. It’s definitely improved my mood, and creative flow. One day, I will buy some neutral wool, and make some cute cats and miniatures. Until then, here’s an orange and mustard tabby, with blood red nose and weird mouth. 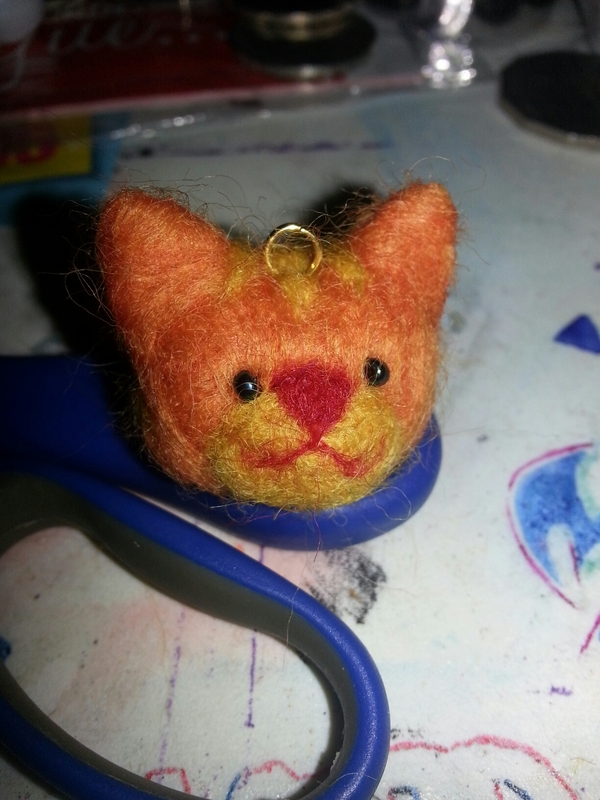 I saw a video showing the process of a needle felting kit for a cat keyring. 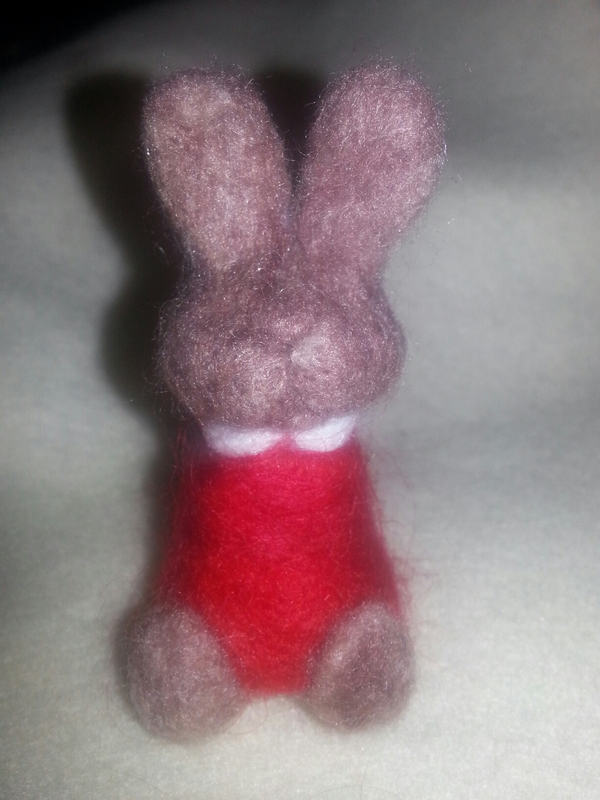 It was cute, but I thought it was a bit big for a keyring, and wanted to make a smaller one. I can’t seem to get the ears to work as easily as the video, although they skip any time consuming parts. It seems to take a lot more effort than they show, and a lot less blood loss, despite them holding the needle right at the end so they have no control! Guess they just make it look easy. I ended up sectioning off too much orange wool, so decided to try making a ring. Unfortunately, my finger size crossed with orange wool made the ring look exactly like a burger ring, and made me hungry. I don’t even like orange, or the feel of wool, so it was just a trial. Delicious looking trial. 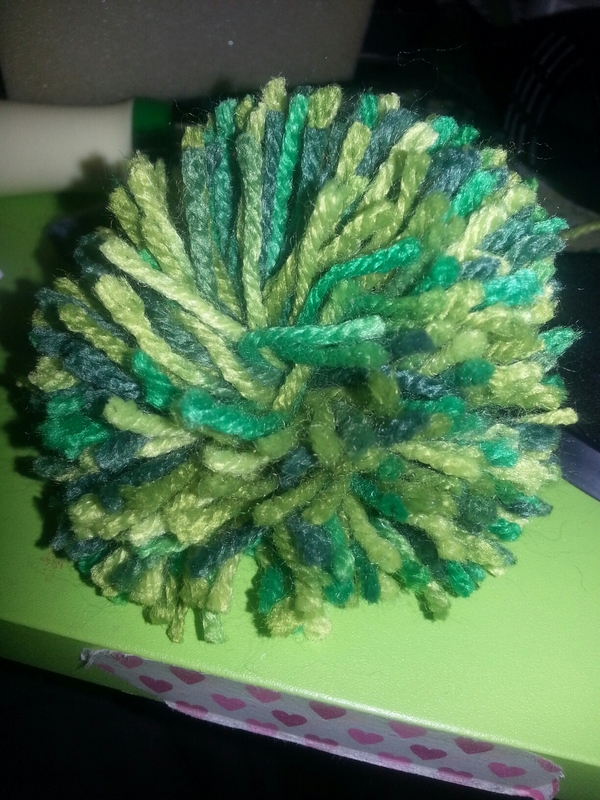 I also made yet another ball. This time using a plastic stencil to felt a heart shape on it. It worked rather well. Using the same concept as the cookie cutter, but being careful not to stab the hard plastic, in case you break the needle. I also began another orange/ginger cat. This time as an ornament. I have a curled up cat figure and wanted to make my own version. Took ages to just make two legs and the tail. 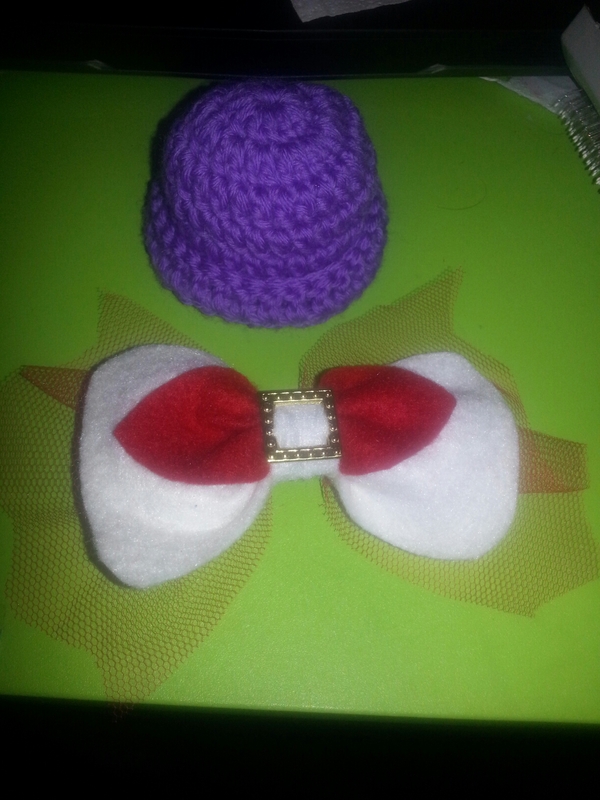 I still have to make the ears, which hopefully will work better this time. 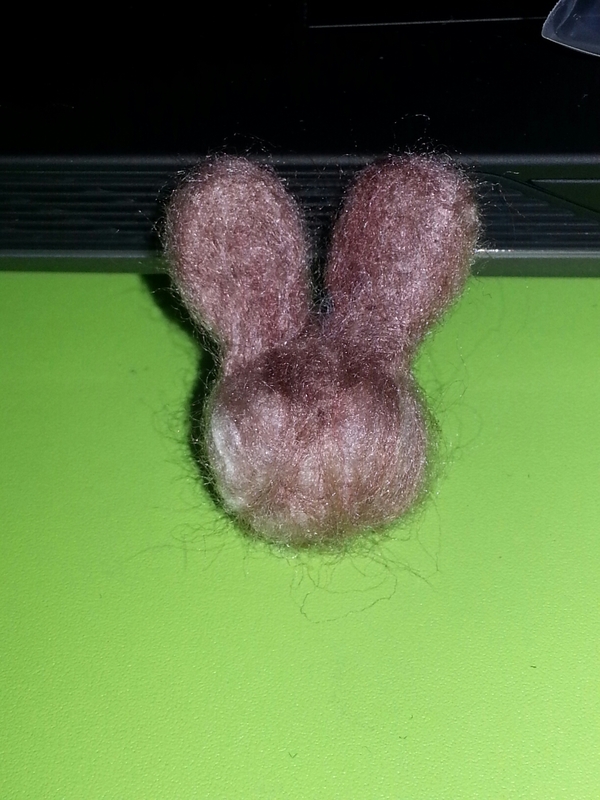 I hope I’m getting better at the needle felting. It seems like I’m still getting an awful lot of new finger wounds.